The old-established Jowett Company commenced car manufacture as long ago as 1905. Some time ago, under the auspices of John Baldwin, the present Publicity and London Manager, a fascinating little book was published which outlined the history of this sturdy Yorkshire concern. Consequently, we can dismiss the earlier years after remarking that the firm's speciality was the watercooled, horizontally-opposed twin-cylinder light car, for many years of 7-h.p. rating, afterwards increased to 8 h.p. A very impressive number of these two-cylinder Jowetts is still in service, visual testimony to their good quality and design which resulted in long-wearing qualities. Some years before the Second World War it was decided to add a four-cylinder model to the Jowett range and experimental cars embodied in-line engines. 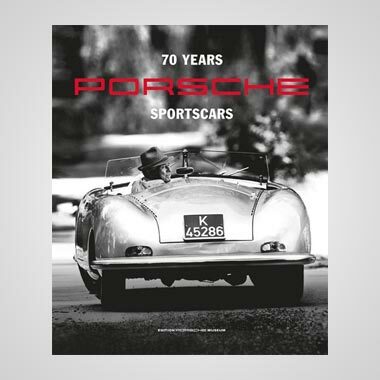 It was felt inadvisable, however, to break with the long horizontally-opposed tradition and when the new car, known as the "Jason," went into production in 1936 it had a side-valve flat-four engine. An attempt to offer good visibility by using a sloping radiator met with a mixed response from the motoring public, but it can be said that the flat-four engine was adopted for sentimental rather than engineering reasons. It was not until after the war, when an entirely new post-Armistice Jowett was designed, that the horizontally-opposed four-cylinder engine was fully exploited. When Gerald Palmer introduced his brilliant Javelin six-seater saloon, inspired to some degree by the popularity in England of the Italian Lancia Aprilia, he retained the flat-four engine and achieved comfortable, spacious seating, within the wheelbase by reason of the compact dimensions of this engine layout. In addition, freedom from vibration, a low centre of gravity, and good visibility by reason of the modest height of the power unit were other flat-four advantages. The new engine had overhead valves and was at first prepared in two forms, a 1,200-c.c. unit of 69.5 by 78 mm. bore and stroke, and a 1,500-c.c. version of 72.5 by 90 mm. bore and stroke. The former engine was intended for the home market, the bigger unit for export; both had a compression ratio of 7.25 to 1. Subsequently a change of policy caused Palmer to concentrate on the larger engine of 1,496 c.c. In its early form this engine had a two-bearing crankshaft running in white-metal bushes carried on the crankcase, a circular spigotted cover at one end obviating the need for a split crankcase. The crankcase was of aluminium alloy to D.T.D. 424 specification, and wet cylinder liners sat on a joint washer at the base and were clamped down by the detachable cylinder heads. The cylinder heads were of cast iron with a vertical inlet port leading to siamesed valve ports to provide for one downdraught carburetter per pair of cylinders. 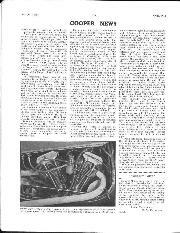 The exhaust ports were at the bottom of the heads, the gases being led away via an integral manifold under each head. A metal duct directed cooling water to each valve seat. The combustion chambers were of stepped type, the inlet platform providing a "squish" area to promote charge turbulence over the exhaust valves, from which side the mixture was ignited. The push-rod o.h.valve mechanism incorporated hydraulic tappets to compensate for dimensional changes in the alloy crankcase. These tappets were lubricated from one of the main oil galleries, with lubricant filtered by the full-flow method. The new engines, in both sizes, were extensively tested on the bench and on the road in this country. The prototypes had 10-mm sparking plugs, but subsequently 14-mm plugs were used. The 1,496-c.c. version developed 40 b.h.p., soon increased to 50 b.h.p. by improved aspiration. During early testing, when, incidentally, a Bradford back axle was used on the prototype Javelin -- later American axle components were tried before the final adoption of Salisbury units possessing a very high margin of safety -- the engines proved mechanically noisy in a harsh resonating manner. This decided shortcoming in what was destined to be a luxury small family car was a major problem, calling for a cure. Two forms of crankcase had been prepared, one in cast-iron, the other in aluminium. Experimental work on these early designs made it quite clear that there was considerable whirl of the crankshaft and a certain amount of flexing on the crankcase as was evident from edge marking on the bearings and deflexion tests. The next development was to prepare a cast-iron crankcase and a three-bearing crankshaft, the bearing-cap joint faces being horizontal, so that the crankshaft and flywheel assembly could be dropped out of the bottom of the engine. The first experimental engine of this type was of 1,200 c.c. and when experiments were carried out with larger-diameter liners, increasing capacity to 1,500 c.c., considerable crankcase thump was experienced, and to experimentally overcome this, boiler plate was bolted across the bottom of the bearing-caps, overcoming this problem and pointing out the inherent weakness of this crankcase design. Subsequent development was the adoption of the light-alloy crankcase split vertically, permitting the use of tie-bolts, making a very much stiffer job. Previous experience had determined the fact that the cast-iron crankcase did produce a quieter engine, but it was decided that the alloy crankcase should be proceeded with, it having been designed for die-casting. The cast-iron version was approximately 10 per cent. quieter than the alloy one, but was naturally heavier. In view of this, and the difficulty at that time of obtaining iron castings, the split alloy crankcase was decided upon. It was at this stage that the 1,200-c.c. project was dropped, as there was such a pronounced performance difference between it and the 1-1/2-litre engine. When the revised engine was tested for output a considerable drop in power was seen to occur above 4,250 r.p.m. Observation showed inadequate freedom of breathing and poor turbulence in the stepped head. The valve lift was increased from 0.275 in. to 0.315 in. and the ports cleaned up. Westlake was called in to inspect the combustion chamber formation and he evolved a semi-pancake head with 14-mm. plugs, easier to produce and increasing top-end power output by 15 per cent., while providing smoother running. The exhaust system was changed from streamlined exhaust ports brought out to the bottom face of the head, to a manifold bolted to the underside of the head, the off-side manifold feeding into a pipe running round the front of the engine to enter the nearside manifold and take benefit thereby of extractor action. The main exhaust pipe led from the back of the near-side manifold. It had a 1-3/8 in. inside diameter and the power drop with silencers was only 3 b.h.p compared with an open pipe. This new exhaust arrangement gave a power increase of 1-1/2 per cent. and no longer were the cylinder heads "handed," a production and service advantage. Snatchy running below 20 m.p.h. led to an increase of flywheel diameter to the limits of the bell-housing. Another outcome of initial testing was the need to alter main bearing clearances due to rapid crankcase expansion. A steel housing giving 0.0003 in. to 0.0018 in. clearance at assembly temperature was finally adopted. The Javelin now emerged as the first really new British post-war car, a comfortable, brisk 5/6-seater saloon giving 75/80 m.p.h. and 28/32 m.p.g., with the advanced aspects of flat-four engine, torsion-bar suspension and wind-defeating body form. The prototype engines, developing 40-45 b.h.p., had been satisfactory in respect of bearings, but long-distance driving on the Continent with the early production versions showed up a tendency to run big-end and main bearings. With the aforesaid improved breathing 50-52 b.h.p. was developed at 4,500 r.p.m., and it was decided that white-metal bearings must be replaced by copper-lead bearings, if possible in conjunction with the existing E.N.12 steel crankshaft. The flat-four engine layout led to higher oil temperatures than are experienced in in-line designs, which contributed to the bearing failures. The first step was to employ sintered copper-lead, consisting of 24 per cent. lead, 2 per cent. tin, 74 per cent. copper, with a 0.00125-in, white-metal flash in view of the unhardened crankshaft. These bearings showed no sign of fatigue but were extremely sensitive to dirt and scuffing on the crankshaft. A hardened crankshaft was consequently adopted and special care was devoted to assembly and initial running-in. It was also found that the stepped location of the big-end led to distortion on tightening, so a new con-rod was devised, the big-end having an offset-serrated face and clamp bolts increased to 0.375 in. and 400 lb./in.-tightening torque. Maximum distortion was now within 0.00025 in. A dirt-trap hole of 1-1/16 in. diameter had a negligible effect on oil pressure and consumption. The crankshaft was now induction-hardened on the journals and pins to a hardness figure of 512-530 Brinell, and the bearing-surfaces lapped to a finish of 8-12 micro-inches against the former 12-24 micro.-inches. A softer bearing material of 30 per cent. lead, 1.2 per cent. tin and 68.8 per cent. copper, with a 0.00025-in. plated white-metal layer for running-in was used with the new rods and crankshaft, and the bearings now stood up to 50 b.h.p. and 4,750 r.p.m., in spite of the higher oil temperatures and compact bearings of the flat-four layout. The lubrication system was thoroughly tested in the initial stages of development, an engine being rigged for measurement of oil spillage from bearings, relief valve, ancillary services, etc. As a result, the feed to the main bearings was increased and the size of the oilways increased to 7/16in. diameter to obviate a possible danger of bearing starvation under cold-start conditions with the full-flow filter system adopted to ensure clean oil for the hydraulic tappets. The relief valve exhausted below sump oil level to avoid aeration and later the discharge was by-passed to the pump suction side, within the cover. When the three-bearing crankcase was used, difficulty was experienced with oil swirl caused by air transferring from one side of the case to the other. To stop this a surface baffle was introduced, much experimentation being necessary to position it so that it was above oil level yet allowed free passage of air only. Originally the oil pump had been carried on a bearing cap but the vertically split crankcase obviated this location, so it was moved to the timing-case wall and driven by spiral gears from the crankshaft. The ignition distributor, whieh was originally disposed horizontally and driven directly off the camshaft, was now positioned nearly vertically, with a common drive-shaft to the oil-pump driven from spiral-bevel gears from the crankshaft. The increase of oil pump capacity represented an increase of oil pressure from 50 lb./sq. in. to 65 lb./sq. in. After its use on competition cars an oil-cooler, built by specialists to Jowett specification, was incorporated on production engines in 1952. At first this was placed rearwards for accessibility of engine but later was moved to a location between fan and radiator. With the oil-cooler in circuit, pressure pulsations occurred at audible frequencies until the aforementioned dirt-trap holes in the big-end caps were deleted. Some interesting experiments were made in respect of air flow away from the behind-engine radiator. Louvres in the bonnet top were found to become ineffective above 50 m.p.h., so pressure areas were checked and it was found possible to extract air from behind the radiator via apertures in the front wheel arches, ugly louvres thus being obviated. 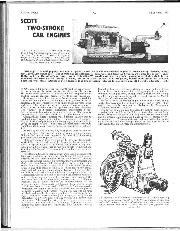 Another difficulty experienced with early production engines concerned noisy valve gear, in spite of the incorporation of Zero Lash hydraulic tappets. Better manufacturing standards were immediately adopted but a fairly heavy patter persisted. A special rig was built to investigate suspected deflection of the valve gear, which was substantiated. The attempted cure was to change from the somewhat "fierce" cam form of 0.002 in. opening ramp and 0.006 in. closing ramp to a cam form providing an 0.003 in. opening ramp of constant velocity and an 0.012 in. closing ramp with a combination of variable acceleration and constant velocity, the cam period being slightly reduced to avoid increased valve overlap. When operation showed no improvement a cam with an 0.006-in. opening ramp with constant acceleration and a closing ramp of 0.015 in. with variable acceleration gave slightly quieter running. By connecting the noise-meter to an oscilloscope and watching recordings of the valve movement on a cathode ray tube, it was discovered that noise occurred at both opening and closing. The next step was to design a cam form with an opening ramp of 0.004 in. and a closing ramp of 0.020 in. modified to give correct lift. Noise was now considerably less on the closing side, but it was deduced that an opening ramp in excess of 0.006 in. would be required. A mathematical investigation was made to ascertain the theoretical seating of the valve for various valve-gear deflections. The final cam form gave an 0.008-in, opening ramp and 0.020 in. closing ramp. This, with stiffer rockers and rocker mountings, maximum possible cleanliness of oil supply, freedom from oil aeration, good manufacturing standards of mating parts and stiffer push-rods, effected the desired improvement. Unfortunately hydraulic tappets became unobtainable during 1950 and the noise level rose somewhat with the enforced use of ordinary tappets. Experiments at this stage were made in respect of camshaft and tappet materials. A high-duty 1 per cent. chromium cast-iron camshaft with a tip hardness of 40-45 Rockwell C. and chilled iron tappets of similar hardness, and a finish of 7-10 micro-inches gave excellent results up to a cam loading of 120,000 lb./sq. in. A phosphate process on cam and tappet faces to retain oil during running-in was found beneficial but not really necessary, but trouble intervened if the tappet head finish fell below 20 micro-inches and the chill lower than 36 Rockwell C.
Five different forms of liner/piston combination were used in the course of development. Vacrit high-duty manganese-chromium-iron liners with a 280-270 Brinell surface hardness were originally used, in conjunction with split-skirt pistons in LO-EX or LM 13 alloys with two D/26 radial thickness pressure rings and a slotted oil-control ring. The liners were first located by a set-screw through the block into the liner skirt, but slight piston scuff resulted from retention of dirt particles and the liner skirt tended to distort. Oil consumption varied from 1,000-7,000 m.p.g. on production cars. Lapped side rings and barrel-ground pistons were tried, and assembly and service techniques were developed to obviate oil leak throughout the engine. A taper-faced Vacrome chromium-plated top piston ring was adopted to cut oil consumption, without entire success. Liner distortion was suspected and investigation showed that while 0.008.- 0.010 in. gasket nip at 38/40 lb./ft. cylinder head tightening torque was satisfactory to retain gas and water seals, this was highly critical, any degree of higher torque loading or excessive nip caused local liner collapse and consequent distortion. To counteract this the liner section was stiffened and an internally-stepped second ring fitted to facilitate quick bedding-in of the chromium-plated piston ring. After this a Javelin ran 80,000 miles in the course of testing by the Avon India Rubber Co., Ltd., gave an average of 3,700 m.p.g. of oil at 37-39 m.p.h. 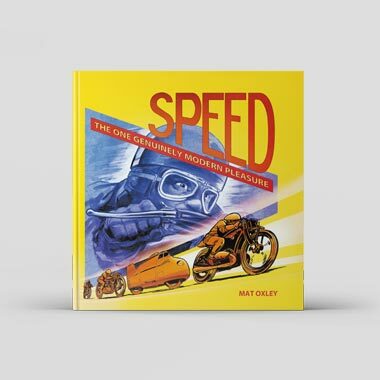 average speed, and maximum bore wear averaged 0.002 in., equal to 40,000 miles per thou. Carburation was the subject of special attention, in view of the Javelin's unusual firing order of 1, 3, 2, 4. Cylinders 1 and 3 are fed from one carburetter via siamesed ports, and 2 and 4 from the other carburetter. To combat weak mixture in the front cylinders of each bank, caused by inlet tract surge, a 0.550 in. diameter balancer pipe was introduced between the two carburetters. Difficulty of working in the conventional exhaust hot-spot resulted in flat-spots between idling and main jets, but adjustment of the level of the progression hole to the edge of the throttle blade in the Zenith carburetter cured this. A further induction system peculiarity was a very harsh staccato noise at the intakes, unacceptable in what was not a sports engine. Experiments proceeded with many makes of air cleaners and silencers but it became evident that a very large silencer would be required to attain a reasonable noise level and this would about cover the engine and render it inaccessible. Consequently Jowett evolved their own baffle-box, accommodated in the alligator-bonnet, tuned to length to suit the induction system, and connected to a resonance chamber which was coupled to the air intakes by vertical pipes having squash rubber connections which broke as the bonnet was lifted. A non-spill oil-bath air filter was incorporated. Reverting to the carburetter balance pipe, when this was fitted it was adapted to ventilate the engine, in conjunction with an A.C. vacuum valve in the oil filler tube. A minor development feature was a change from flat pressings to tubular stays as supporting legs for the cooling-fan shaft, as the flat section caused noise as air flowed over them. To the early bearing failures and excessive oil consumption of some Javelins has been added gasket blowing, but it should be remarked that this was due to too small an asbestos content at the fold of the gasket, and it was only with increased output for competition purposes that contributory causes came in. So far we have dealt with the production engine only, and the painstaking research and development devoted to perfecting this advanced design of flat-four power unit with rear-placed radiator is truly a credit to the Jowett Company -- even if the public are well advised, in respect of all new models, to wait until the initial snags have been eradicated before purchasing. 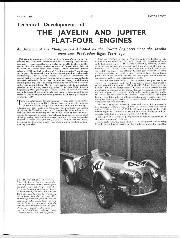 In 1949 the Javelin engine was developed for competition motoring and class victories were obtained in events as diverse as the Rheineek-Walzenhausen Hill-Climb and the Spa 24-Hour Race. The Spa Javelin saloon gave about 57 b.h.p. and had the oil cooler and copper-lead bearings, etc. Flywheel weight was halved, being reduced from 28 lb. to 14 lb. These Javelins also ran at Silverstone. Meanwhile, the Jowett Company had decided to put into production the two-seater sports Jupiter, the chassis of which was based on a tubular-frame design evolved by Leslie Johnson in association with the German engineer Eberau von Eberhorst. 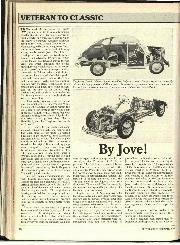 It is significant that about this time the Jowett Company issued its "Competition Tuning Notes" to those Javelin owners who sought an increase in performance. 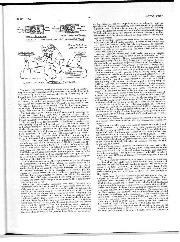 The usual port-polishing and relieving was covered in respect of this particular engine, stronger outer valve springs were recommended and special pistons were declared available for increasing the compression ratio from 7.2 to 1 to 7.6 and 8.0 to 1, a reduction in combustion chamber space of 2 c.c. and a further 3 c.c., respectively. The standard Zenith VM 4 or 5 carburetters could be replaced by 30 VM Zeniths, and it was assumed that the hardened crankshaft, copper-lead bearings, larger water and oil pumps, later oil filter assembly and the oil cooler, would be employed. Subsequently similar "hotting-up" of the Jupiter was permitted, with increase of compression ratio from 8.0 to 1 to up to 8.5 to 1 for 80-octane fuels, this being obtained by using thin gaskets. Stronger inner valve springs were recommended and the flywheel could be lightened. It was assumed that correct fitting and assembly would be ensured and that the modified h.t. cylinder-head studs, Lucas DV X4A distributor and the later cooling arrangements used, and Champion L 11S or LA 11 sparking plugs fitted. 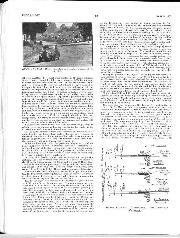 Charles Grandfield and Horace Grimley, who later developed the Jupiter for racing, had tested a prototype sports version over 3,000 miles from John o' Groats and across France, at a running average speed of 54 m.p.h., and an over-all average of 46 m.p.h., fuel consumption working out at 31 m.p.g. The next step was to prepare the Jupiter for participation in racing. For Le Mans in 1950 a compression ratio of 8.5 to 1 was obtained by the employment of thin head gaskets and with stronger inner valve springs, high-duty ignition distributor and lightened flywheel: the output was 64 b.h.p. 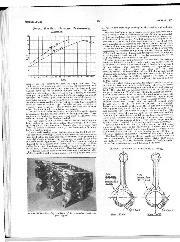 To obviate gasket trouble the strength of the cylinder-head studs was increased from 45 to 60-65 tons tensile, but the number and position of the studs were unchanged. The plugs were stepped up from Champion L 115 to Champion LA 11. 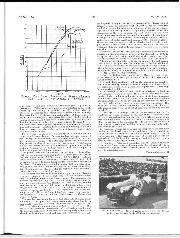 The 1-1/2--litre class was won at 75.84 m.p.h. 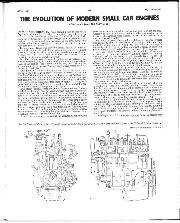 For 1951 the porting, valve timing, etc., were improved, and after experiments with compression ratios of 8 to 1, 8.5 to 1, 9 to 1 and 9.25 to 1, the last-named ratio was employed. Just over 100 m.p.h. was obtained from the R1 Jupiter, but after six hours at Le Mans the C.A. gaskets collapsed. A composite copper, asbestos and steel gasket was found satisfactory, after experiments with solid copper, laminated aluminium, and corrugated cupro-nickel gaskets. etc. This gasket is now used on all production engines but, eventually, for racing, a gas-filled metallic sealing ring at 600 lb/sq. in. pressure in a circumferential recess on the liner top flange stood up to the highest compression ratios. A Plexseal gasket was used as a water joint. The gasket failures were finally traced to sinking of the cylinder liners and this was cured by redesign of the liner bottom seal, a rubber ring trapped between the liner bottom flange and the crankcase permitting a metal-to-metal contact between liner and crankcase, obviating liner sinking and enabling the initial liner interference on the gasket to be maintained. 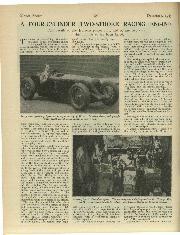 The 1-1/2-litre class was won at Le Mans. For last year's Le Mans R1s retained the 9.25 to 1 compression ratio, with flat-top pistons. The serrated-face big-ends were used and the top piston-ring lands were increased from 3/32 in. to 1/8 in., and to reduce a tendency to piston-ring flutter and increased oil fling, pressure loading of the scraper ring was put up to 70 lb./sq. in. ; 2 b.h.p. was gained by using the solid-skirt piston, due to less friction. Trailing oilway drillings were used on the crankpins to feed oil at a point of minimum pressure. The pistons were now solid-skirted and of die-cast silicon alloy, with the top gas-ring chromium plated. Stronger valve springs met the engine speed of 5,500 r.p.m. KE 965 (EN 54) exhaust valves combated a neck temperature of 700-800 deg. C., which had caused an XB valve to break during the 1951 Silverstone Production Car Race. The stems were chromium plated, 0.001 in. extra clearance given at the guides, and the valve tip at the rocker end stellited. With 0.5 milli-litre per litre of lead in the fuel, valve life was approximately 200 hours at 4,500-5,000 r.p.m..
An external carburetter balance-pipe of 5/8 in. internal diameter was now required. A Lucas high-duty DXV4A distributor was used, with Lodge plugs in waterproof covers. The crankcase was stiffened by ribs radiating from the main bearing regions and the walls were also stiffened. The Marston Excelsior oil cooler, radiator and reserve fuel tank were fabricated in aluminium alloy, with a weight reduction of 45 lb. An axle ratio of 4.1 to 1 was employed instead of the former 4.56 to 1. 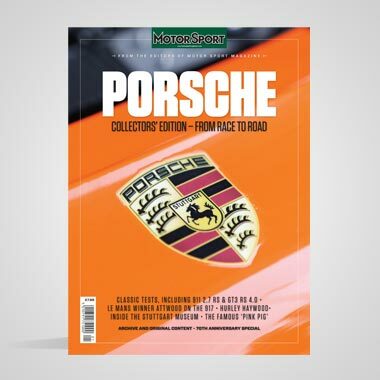 The engine now had a fuel consumption of 0.51 to 0.57 pint/b.h.p./hour, equal to a race fuel consumption of 18 m.p.g., and the third consecutive 1-1/2-litre class win at Le Mans. The standard crankshaft broke on test after only 50 hours bench running at 4.200 r,p.m., with compression ratios above 8 to 1. A crankshaft which had run some 200 hours broke during the 1950 T.T. race, when a compression ratio of 8.75 to 1 was in use. This led to a mathematical investigation of crankshaft dynamics and the most probable cause of the crankweb bending fatigue failure was thought to be combined axial and torsional vibrations of the crankshaft system in conjunction with the presence of an adverse residual stress system in the crankpin fillet adjacent to the fracture; this residual stress was due to induction hardening of the bearing-surfaces especially if followed by a cold straightening operation allied with stress risers in the form of sharp fillet radii and tool marks on the webs. A new crankshaft was developed incorporating fillet radii on all bearings of not less than 0.100 in. The crankpins were also drilled so as to reduce off centre weight and the magnitude of the bending loads. Great care was also necessary when induction hardening the crankpins so as to ensure that the hard zone does not extend into the webs, also that the fillet radii and journal surfaces were free from quenching cracks. Experiments showed that shot peening the fillets could considerably increase the fatigue resistance, using 1/32 in. dia. chilled shot at 25 to 30 lb./sq. in., the crank being rotated during the peening operation, also the practice of rolling the fillet by steel balls was effective. A load diagram on a polar basis was drawn up for big-end bearing loads above 4,750 r.p.m. and the serious inertia loading was found to be sufficiently important to warrant drilling the racing crankshaft with oilways at approximately 60-deg. trailing on each crankpin. As aforementioned, oil temperature was held to a maximum limit of 75 deg. C. under racing conditions. 1. Crankshaft -- The crankshaft has been redesigned in detail so as to increase its fatigue strength. The modifications in this direction consist of the crankpins and main bearing fillets being increased from 0.050 in. radius to 0.16 in. radius, also the hardening technique has been altered so as to ensure that the hardness does not run into the crank webs, where it may introduce stress concentrations. The weight of the crankpins has been reduced by drilling a 7/8 in. diameter hole through them with the object of reducing the bending load on the shaft. 2. Oilways -- The oilways both in the crankshaft and in the crankcase have been modified; in the case of the crankshaft these have been repositioned so that they emerge on the crankpins in an area of minimum load, which allows the oil to build up a more stable film. In the case of the crankcase the oilways have been increased in area so as to avoid any possibility of restriction, especially under cold starting conditions. 3. Bearings -- These are now, with the exception of the rear main bearing, of Vandervell manufacture and are of the tri-metal type which consists of a steel backing strip on which is cast a layer of copper-lead alloy; this layer of copper-lead is then plated with an approximately 0.003 in. thick coating of lead indium alloy which actually acts as a bearing medium. 4. Crankcase -- This has been stiffened by the addition of radial webs on the front, centre and rear panels, the object of this is to increase the rigidity of the structure, which to some extent will assist in minimising noise. 5. Cylinder heads -- The combustion chambers and the ports are polished and the ports are lined up with the manifold ports. This will improve the gas flow characteristics and will reduce any tendency towards "run-on." 6. Camshaft -- An adjustable end location is now provided for this so that individual adjustment can be carried out to reduce any noise resulting from excessive end float. 7. Cylinder liner bottom seal -- This has been redesigned and now consists of an oil and heat resisting rubber ring trapped between the liner bottom flange and the crankcase. There is thus a metal-to-metal contact between the liner bottom flange and the crankcase, which obviates any tendency to liner shrinkage due to collapse of the bottom joint. This ensures that the initial liner interference on the gasket is maintained and will result greater gasket reliability. 8. Oil pump -- This is now of a submerged pattern which ensures instant priming under all starting conditions, and the relief is by-passed to the suction side of the pump to reduce oil churning and frothing in the sump. 9. Pistons -- The proportion of the piston ring lands has been increased so as to improve the fatigue resistance at this point. 10. Sparking plug covers -- The original design of bakelite cover with the bayonet fixing has been deleted and this has been replaced by a moulded rubber cover designed by Messrs. Lodge for racing motor-cycles. This cover is very simple and improves the accessibility of the sparking plug. All this development work has been done in the last five years or so and our account covers only that applied to the engine, this being of such unusual layout as to occasion much interest in how its teething troubles were overcome. 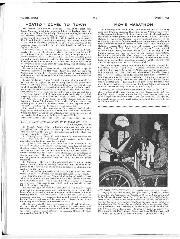 The reader must by now be impressed with the very thorough testing and research undertaken by the Jowett engineers and be particularly pleased to learn how much they owe to racing and competition work. The Jowetts with the Series III engine are still well in advance of conventional practice and have gained in performance and reliability since the brave introduction of the Javelin eight years ago. Once again, I cannot refrain from observing that at idle they are anything but idle ! -- W. B.
Avon India Rubber Co. Ltd.